Good morning everyone! I have a few of the new Jindie Nails colors to show off today! During the presale I grabbed a few of the Fall Chic colors and 1 of the Halloween colors- they were just listed for sale yesterday, so it seemed like a good time to show them off! Even though my nails are short again- I’ve been suffering from MORE breaks. Thankfully the worst ones were on my non-swatching hand, but still! After going so long with no casualties, it’s been hard. It feels like maybe my nails are TOO strong now- the breaks happen whenever I bump something and a side part just chips off. Not a problem I ever expected to have 😉 I actually like my nails shorter just fine- but I’d like them just a tiny bit longer, for reasons I’ll explain in a minute. First, I’ll show off the 4 colors from the Fall Chic 2013 collection I have. All of these polishes are packed *full* of circle glitter in various sizes and colors. This is true for all 4, so I’ll talk about it here versus repeating over and over- I didn’t have to fish for any of these glitters. What you see is minimal effort for glitter- even on Midnight Rainbows. So the glitter payoff is excellent. The only issue I had with any of these wasn’t really the fault of the polish- but I struggled a bit more with them due to the length of my nails. Larger glitters take up more available space when your nails are smaller (I know, thank you Captain Obvious), and I had to be sure to stick to thinner coats than I would normally do to avoid a big mess. It wasn’t too hard, but it was a bit more challenging on short nails to get things looking nice. Just me adjusting to the new length- you wouldn’t think it would impact the way I paint, but it does. Also, Jen just introduced her new medium size 9mL bottles, which is what you’ll see in this post. I really prefer these so much to the previous mini bottles. I don’t mind most mini bottles (and sometimes prefer them due to the sheer size of my collection), but the issue with the old Jindie ones was that the brush wasn’t able to reach almost any polish unless it was fully twisted in. It was a pain to use, especially with the glitter based polishes (though they were very cute bottles!). But now, you’re able to reach plenty of polish and the brush is very long. And it also holds a bit more polish! The first polish from Fall Chic is What Are You Smokin’ Mirrors! This is a medium grey crelly polish filled with tons of gold and silver dots and flake shimmer. I used 2 coats with topcoat for these photos. The coverage was good- I did have to brush off a bit of excess grey base from some of the circles so that they would show, but other than that I had no issues. This polish is something else! 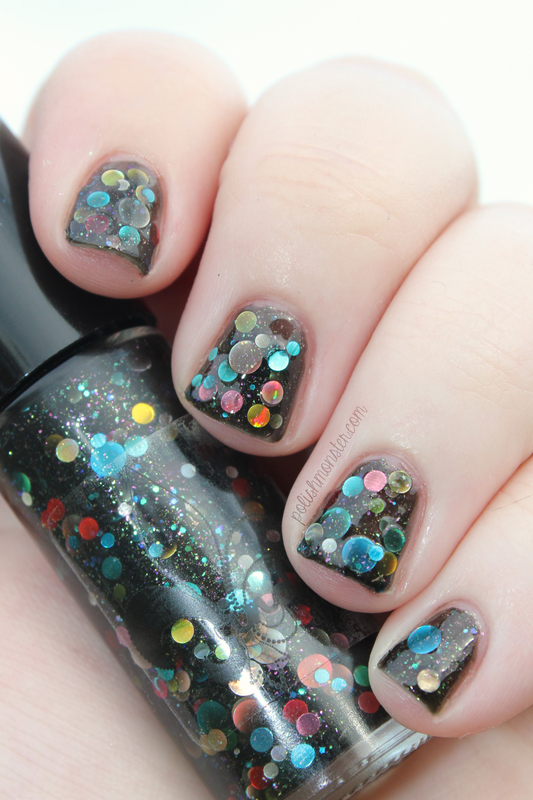 It’s a black jelly polish filled to the brim with rainbow shimmer and metallic circle glitter in tons of sizes and colors. And when I say to the brim- like I said at the beginning of this post, I didn’t fish for glitters. What you see here is 2 coats with topcoat- with no fishing. I’m sure if I actually tried there could be MORE circles on my nails! This polish went on well- I had to do a bit of dabbing to get circles the way I wanted them to be. There’s so many in the polish that sometimes they can clump up a bit, so you just need to spread them around once they’re on the nail. Now we have Breakfast at Tiffany’s Cousins. 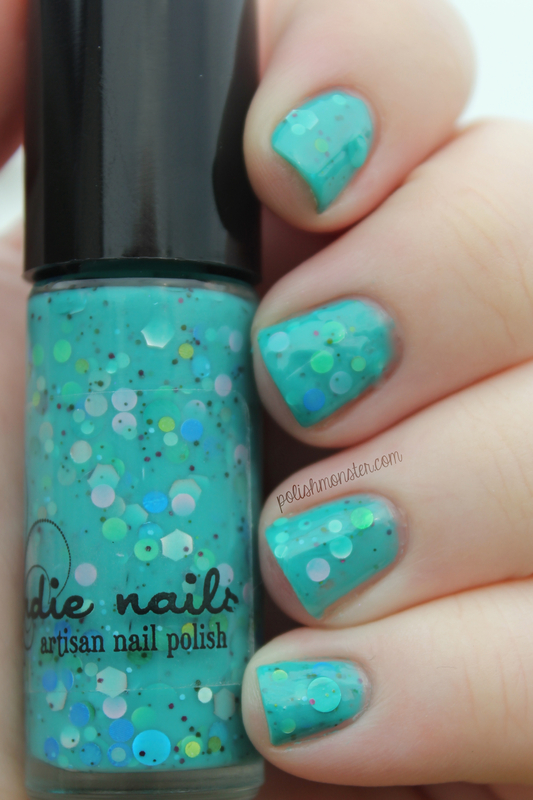 Breakfast at Tiffany’s Cousins is a teal crelly polish filled with maroon, lime green, blue and silver glitters. Plenty of large circles and hexes in here, and I didn’t have to fish for any of them! Pictures show 2 coats with topcoat. I’m glad she sent it though- this was my surprise favorite of the bunch, and I would’ve missed out on it otherwise! 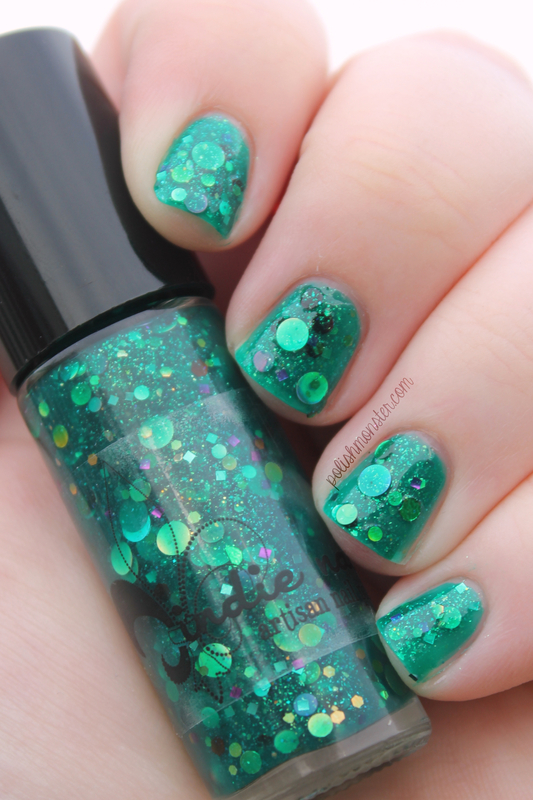 Shimmer Me Timbers is a bright, juicy emerald green jelly polish filled with a bright gold shimmer and lots of green and gold glitters (along with a few blue, maroon, copper and purple too!). 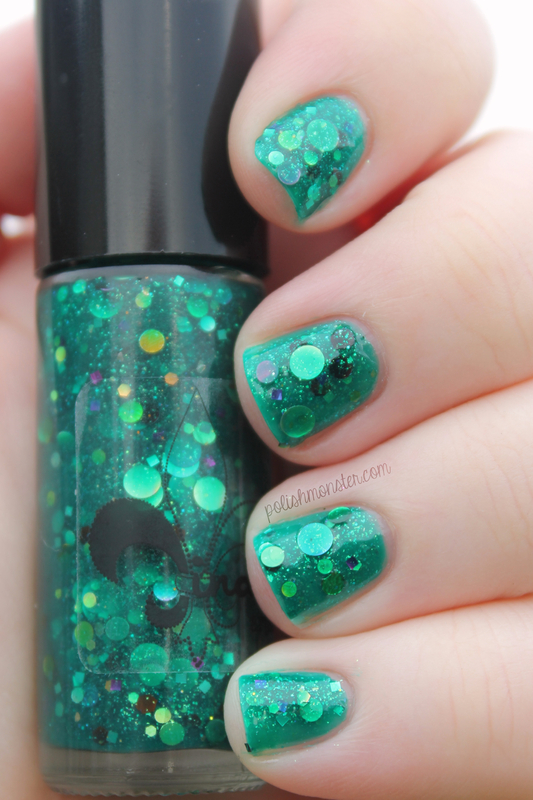 I think what surprised me is that this polish is a lot ‘brighter’ than I realized- it’s still a deep emerald, but since it’s a jelly it still retains that squishy feel, and the shimmer brightens it up a lot. The pictures show 2 coats with topcoat. Application was great, this one went on the most smoothly of the bunch! Last but not least, we have Be-Wear the Polish, my only purchase from the Halloween colors. There’s a lot of *gorgeous* colors in that collection- but I was trying to be good! 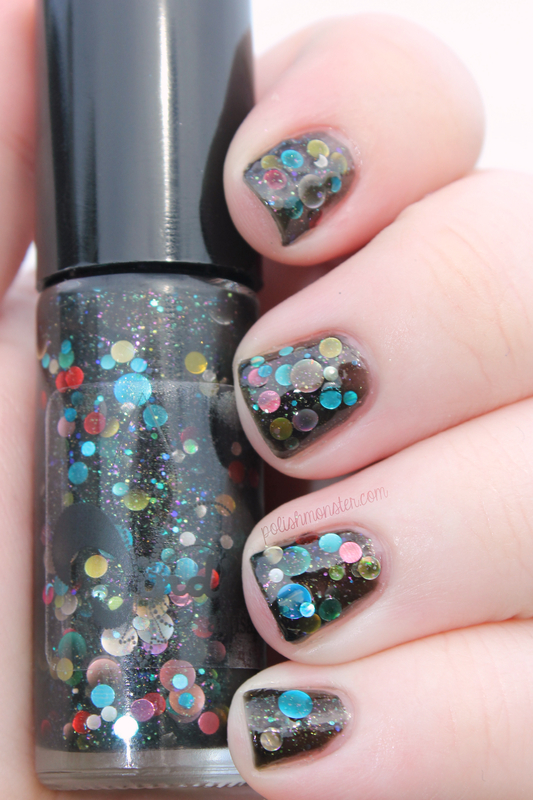 Be-Wear the Polish is a fun glitter topper (glitter in a clear base, meant to be layered) filled with green, grey, black, and purple glitters in various shapes and sizes, TONS of fine glitter and shimmer- and also glow in the dark glitter! I tried desperately to get a picture of the little flecks glowing, but my camera didn’t want to cooperate. Application was great- this is so overflowing with glitter, I didn’t have to make an effort to have my nails covered. In fact, I usually ended up with a bit too much on my smaller nails and had to decide which to put back in the bottle! Photos show 1.5 coats (I did 1 full coat on each nail, and then filled the brush and dabbed a little extra here and there to fill in some empty slots) with topcoat over Wet N Wild’s Sea Ya Soon (post on that later today). I think overall my very favorite was Be-Wear the Polish- this is a must have! Between the fun bright colors, variety of shapes and sizes, and glow in the dark glitters, you have something very fun for Halloween. I might be a bit partial though- Halloween is my favorite holiday and I love the green/purple/black/orange color combinations associated with it! This entry was posted on October 4, 2013 by The Polish Monster. It was filed under Uncategorized and was tagged with circle glitter, crelly, Fall, glitter, Halloween, indie, jelly, Jindie Nails.